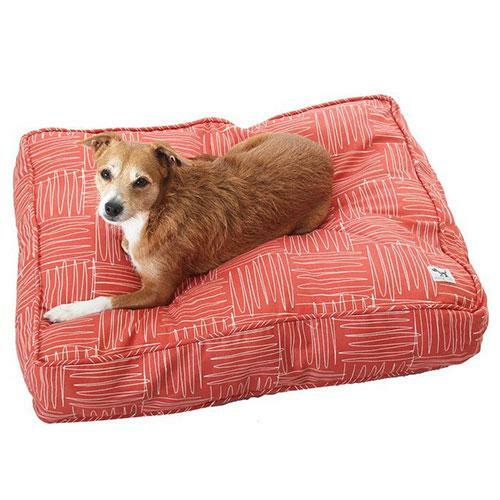 Give your dog a bed that is enjoyable and luxurious with The Molly Mutt Jitterbug Duvet For Dogs. It provides a way that you can customize your dog's bed with duvet covers that are made with 100 percent cotton, this will keep the dog cool and not overheated. You can add extra bedding to the duvet, such as pillows and blankets. The Jitterbug Duvet For Dogs is made to last and is easy to wash. Also, it will not shrink down after it has been in the dryer. If the duvet becomes stained or soiled on, it can be washed in cold water and dried on a low setting. The duvet is easy to keep in a sanitary condition and will give your dog a comfy place to sleep and relax. The duvet has a stuff sack that will help you keep your duvet tidy and clean. You can put the entire stuff sack directly into the washer and dryer, this keeps your dog's duvet fresh. There is a multitude of sizes to choose from; small, medium/large, huge, and round.